I wasn't planning on trading this week due to finishing up a project for school that was occupying a lot of my time. However, I finished it yesterday so decided to begin my "new" trading career today. Essentially I am embarking on a dual track, scalping ES for daily income and building wealth through CL trading trying to catch the larger moves on CL. For the moment, the CL trades will be few and far between as I concentrate on replacing the income from the "real job" I recently left behind. This looks like 2-4 points a day on ES using a tired but true scalping system. Don't ask about it, I'm somewhat embarrassed to show you anything about this system because it relies on indicators but it works so I'm going with it for now. There are no attempts to capture the "big moves" in ES just a piece of one of the legs each day. With any luck and some patience, I will be able to capture perhaps two legs a day depending on my schedule. I still have a full school schedule but I've rearranged my daily schedule to allow for some extended trading hours in the morning. We will see how that works next week. As to my results, I made my first 3 points today in ES. Happy about that and moving into the weekend a winner, always a good thing for sure. Its been a while since my last post. No trading since then. I've been occupied with my school work, getting my new trading system locked in place and dealing with some of my fathers health issues. This week I have a final due on Friday so will more than likely trade very little until next Monday. That said, I'm ready to get back to trading again! Oh, and last week I pulled the plug on what hopefully was the last job I'll ever have. I cannot tell you the incredible feeling of walking away from something I hated. It was as if a huge load lifted off my shoulders and I could breathe again! So thankful that is over. Today's post is not really about the trading. I've not had much time for posting the last couple of weeks. I have a "real" job which incidentally I have come to loath with a white hot passion, I am in the final stages of earning my degree which I have no idea what to do with. Plus I am the taxi driver for my kiddo. All this keeps me pretty busy. I am about 2 days from completely burning the real job bridge. I literally hate it. I thought I'd enjoy being back in the mortgage business but truth be told, I hated it from the first day and I've only grown to hate it more each day. What led me to this decision is this.....the job is sucking the life out of me and I think I'm at a place where I can afford to live on my trading....not because I am a great trader but because I am ready to literally burn the bridge of thinking I am anything other than a trader. I'm ready to own the label. Its been my experience that until you burn the bridge of other options, there is very little success at any of the endeavors you are pursuing. The old Chinese proverb says, "man who chases two rabbits loses both." I'm tired of chasing anything other than excellence in trading. I am under capitalized. I know and understand the issues with this. I fully accept these limitations. 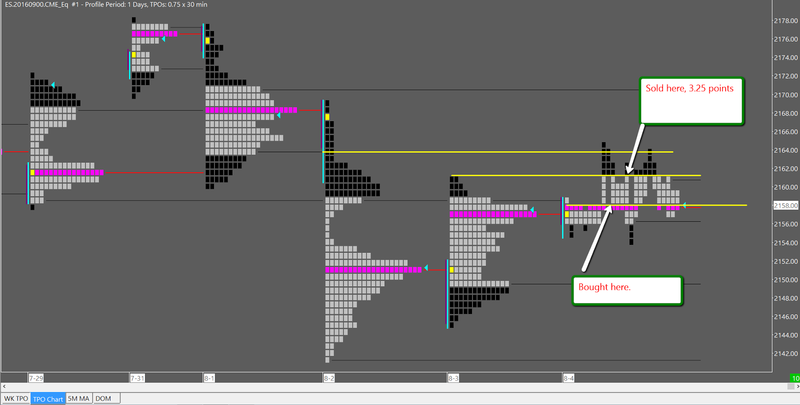 I will be trading one or two lots most of the time....and I will trade both CL and ES. ES will be just for scalping, purely mechanical. I have a mechanical system for scalping 1-2 points a day on ES that I developed a long time ago, it still works, I just wanted to learn how to hit the big ones....so I quit the scalping game. Since ES doesn't move that much right now, scalping is fine on this instrument...I can live on scalping proceeds because my needs are fairly small.......and I will wait for the larger moves on CL to build capital and create wealth longer term. By the way, the yearly totals don't add up from the last post because I've had some wins since then that I didn't post. My CL trade trailed out with a small winner but not enough to really report here. I did a small ES trade in SIM which produced 3.25 points. Seems small but I know many ES traders would kill for 3.25 points a day. I am thinking of expanding the products traded to ES mostly to just scalp for a couple of points a day for income. I think I can do that while building my ability to read and understand MP and VP for longer term trades. I only have the ES chart to show today.